When making any changes or upgrades to your home, you want to be sure that they are done correctly. It’s important to take some time to consider all of the variables, to hire trusted contractors and ensure that the job is done right the first time around. The last thing you want is to have to have the job done again, costing you more time and money. Installing timber fencing is something that takes time, expertise and quality materials. Of course you want to get your new fence in place as quickly as possible, but if you rush the installation, it will lead to problems down the line and will cost you more in the long run. Take some time to consider all the elements of the installation to ensure it is done correctly the first time and will stand the test of time. 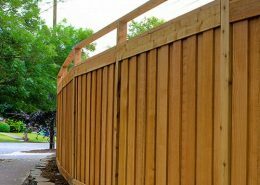 Let’s take a look at a few key areas you need to pay special attention to to ensure that your timber fencing is installed successfully. One of the most important things you can do as a homeowner is to have your property line, as well as the utility lines, marked before you start your project. Your fencing contractor or fence builder may say they will take care of this, but it is essential that it is done right to avoid any damage to city utility lines. It is just as critical to make sure you know exactly where your property line is, as you do not want your new fence built on your neighbour’s property. Another vital part of having your timber fencing installed correctly is to know how high you want your fence to be. In addition, make sure to calculate how many gates you want leading in and out of your yard. Typically, wooden fences can be any height, can be angled where necessary and are usually about 1.8m high. You also need to know how high your gates will be because the height of the gate is used to determine the number of hinges that will need to be installed for each gate. It’s important to know the appropriate fence post depth before installing your new wooden fence. This is important when purchasing the fence posts because not all of the posts will be visible. Approximately half a metre will be buried in the ground in order to provide adequate support. Make sure you plan accordingly when purchasing the correct fence post lengths. In order to avoid any legal issues, it’s important to verify your wooden fence is installed correctly by checking with your city’s guidelines first. If you have used a fencing contractor or a fence builder, they should have contacted the city regarding any required permits or other information related to the project. Some areas may have a height restriction on fences, others might require a permit or will not allow a fence to be built at all. Make sure to check any local laws or requirements before you start your fencing project. Why Does it Matter if My Fence is Installed Correctly? If you went to the bother trouble of calling a fencing contractor out to your property and had them install the fence, then you want to make sure that it is sturdy and installed professionally. The last thing you want to happen is for the fence to fall over or break during high winds. By professionally marking your property and utility lines, determining the proper number of gates and height of the fence, knowing the appropriate post depth, and checking with your city for permits, you will know that your new fence will remain secure for many years to come. 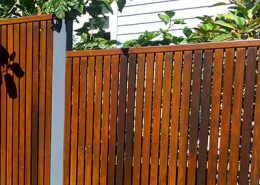 Get your free timber fencing quote with Australia’s number one timber fencing installer. We will ensure your fence is installed correctly and looks great.